Wolfgang Danspeckgruber, founding director of the Liechtenstein Institute on Self-Determination (LISD), advises the 2017 chairmanship-in-office and will co-chair special academic programs for the Organization for Security and Co-operation in Europe (OSCE). Austria has been elected chair of the OSCE for 2017, and Foreign Minister Sebastian Kurz serves as chairperson-in-office. Danspeckgruber and LISD, with the support of the Principality of Liechtenstein, will convene several high-level meetings throughout 2017 and work on security dialogue under the perspectives of generational perceptions of security. Planned meetings will include a gathering of the key think tanks from all OSCE states; colloquia on the influence of religion, values and culture on security; as well as on economics, connectivity and security; on the role of China in the OSCE realm; on radicalization and terrorism; and on the emerging definition of “security.” In preparation for this collaboration, LISD has already convened several colloquia and retreats over the past two years focused on analyzing and evaluating emerging security challenges in Princeton, N.J.; Washington, D.C.; the Principality of Liechtenstein; Berlin, Germany; and Vienna, Austria. The OSCE is the world’s largest security organization with 57 participating states and 11 cooperating countries throughout North America, Europe, Asia and Australia. The OSCE works for stability and security, human rights, democracy, minorities, socioeconomic and environmental matters for more than one and a half billion people, through political dialogue and field activities on the basis of joint principles and commitments. Its decisions are taken on the basis of consensus. The OSCE was established after the Conference on Security and Cooperation in Helsinki, Finland, in 1975 and is headquartered in Vienna, Austria. The organization provides a space for political dialogue on a wide range of security issues and a platform for joint action to improve the lives of individuals and communities. The OSCE attempts to bridge differences and build trust between states by co-operating on conflict prevention, crisis management and post-conflict rehabilitation. Specifically, it focuses on military security, cybersecurity, conflict prevention, confidence and security building measures (CSBM); socioeconomic and environmental issues; and human rights, minorities, democracy building, election observation, media freedom. Its memberstates – from Vancouver to Vladivostok – include the U.S.A. and Canada, all NATO and EU member states, Switzerland, Liechtenstein, Russia and all former Soviet Union States, Mongolia, and also, as partners, Australia, Thailand, South Korea, Japan, Afghanistan, Israel, Jordan, Egypt, Tunisia, Algeria and Morocco, thus making the OSCE the world’s largest security-focused international organization. 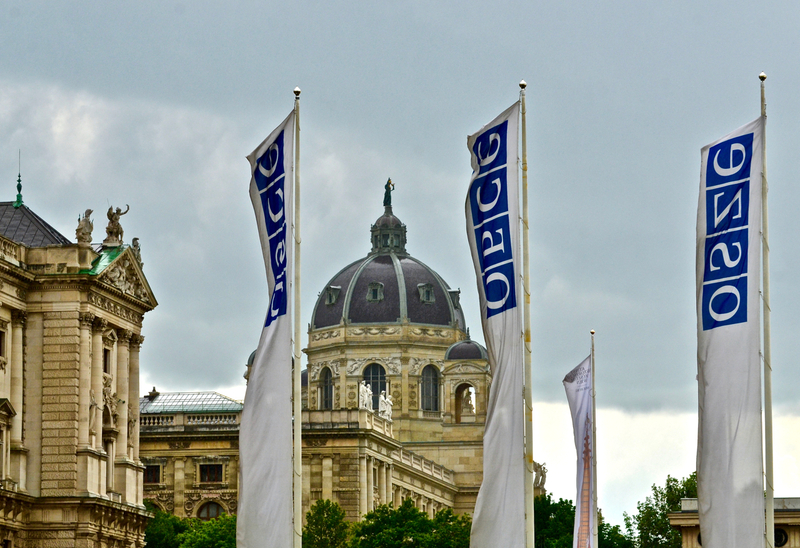 View the full list of participating states and OSCE activities and documents here. Lunch Seminar: Prof. William Wohlforth on "Russia and the USA"
Luncheon Discussion on "The Quadripartite Relationship: USA, EU, Russia, China"
Ambassador Christian Strohal: "Emerging Foreign and Security Dimensions"